The Apple App Store seems to be filled with a glut of endless-runner/platforming games and their ilk these days. From excellent ventures such as Canabalt and Rayman Jungle Run to more suspect knock-offs (Here's lookin' at you, Ham on the Run! ), the average consumer is certainly not lacking in choices for the genre. In this over-saturated market, it takes some truly remarkable elements for a game of this genre to thrive and stand out among its peers. 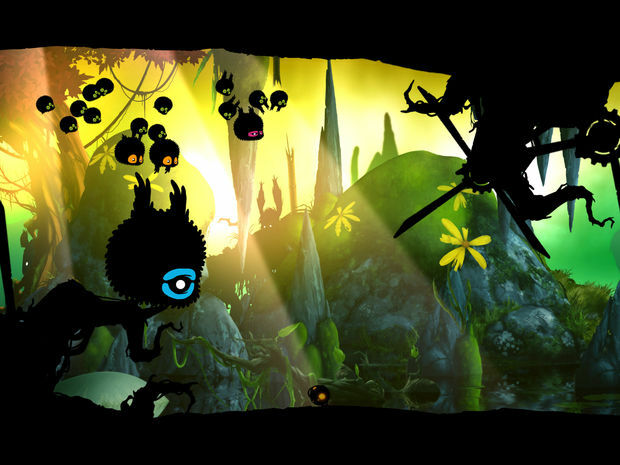 BADLAND seems to be aiming to do exactly that, as the game appears at first blush to be yet another "watch the screen scroll to the left and occasionally mash at it to keep your character from facing certain doom" rehash that any iPad, iPod, or iPhone owner has played a million times before. 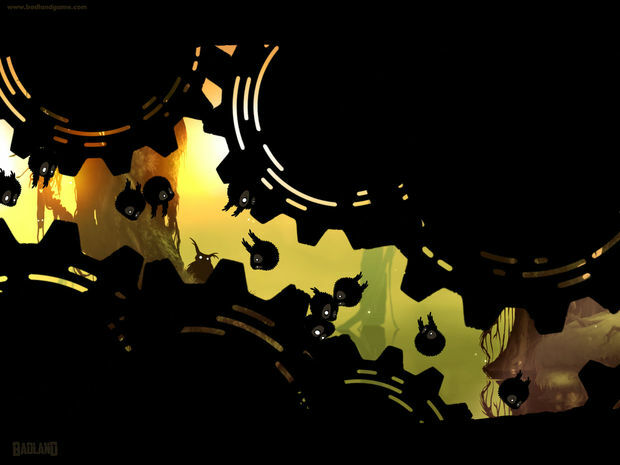 Fortunately, BADLAND has some really wonderful things going for it that firmly places it a few notches above its peers in this stale genre. The addictive gameplay already built into the genre is just the frosting on a deliciously deadly cake. 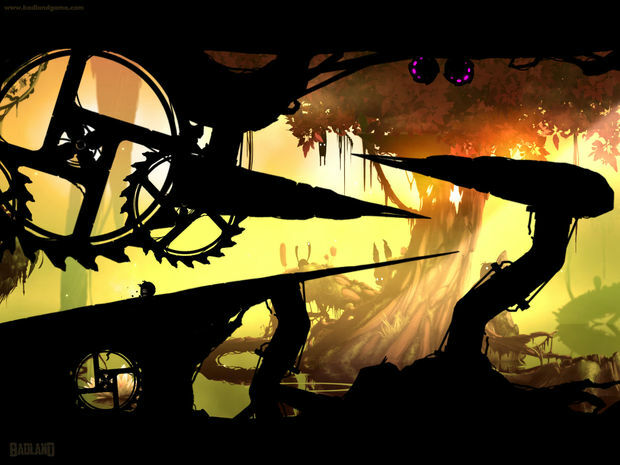 BADLAND draws you in from the beginning with a trippy silhouetted art style and an ambient soundtrack -- both vaguely reminiscent of the eeriness of Limbo. The colorful, bizarre background flora that stands as a stark contrast to the bleak foreground silhouettes and some of the spacier music choices are also reminiscent of the obscure '70s animated film Fantastic Planet. You're not given much of a story to go on, except that you seem to be a furry little hedgehog/popple (remember those?) creature that almost comically flaps its futile little arms/wings to get across each stage. 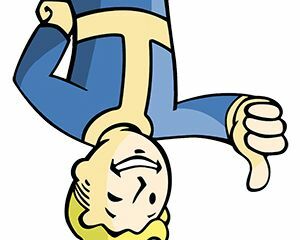 There's something else about a dead rabbit creature hanging upside down and his friends hidden in the background and some sort of race of robot creatures that look like giant metal eggs, but that's all simply background detail and doesn't ever truly get explained. The first couple of levels seem straightforward enough, as they see your character barely scraping by deadly spikes and dangerous plant life to get to the vacuum pipe at the end of the stage. However, it only takes a few more levels before you start to witness the various power-ups that completely change up the gameplay and at times almost ditch the endless-runner style to focus more on quick-paced puzzle platforming. One of the most notable power-ups that aids you throughout the game is the ability to instantly clone your character, either into one other little fuzzball or several others, all huddled together and at the beck and call of your finger taps. Think of your clones as your community of species. As you pass through giant spinning razor gardens and stomping machinery bits, you're going to watch in horror as a few of your community is sacrificed so that the faster and better controlled may live to see another difficult puzzle. In the beginning, this seems like an obvious handicap in completing the harrowing levels, as you watch a massive slaughter of your community only to notice a plucky one or two always survive and get funneled through the deadliest traps. Yet as you make your way through your first day of existence from dawn to night, you start to come across more devious setups that require you to split the paths of your communities in myriad clever ways. For example -- you may be forced to let one of your fuzzballs sacrifice itself for the greater good by taking a path that means certain death, but also opens a switch to release the rest of your community from a blockade ahead. Add to this the great variety of power-ups you'll receive and traps you'll desperately try to avoid, and you quickly get an idea of the tense and fun puzzles you might face in a single level. A few of these power-ups include some that make your fuzzballs grow larger or smaller, some that make them bouncy or sticky, and others that slow down or speed up time. The levels themselves are designed in a manner so that no power-up is wasted; nearly every one of them is one you'll need to use somehow, or at least will make the next section a little easier to get through. 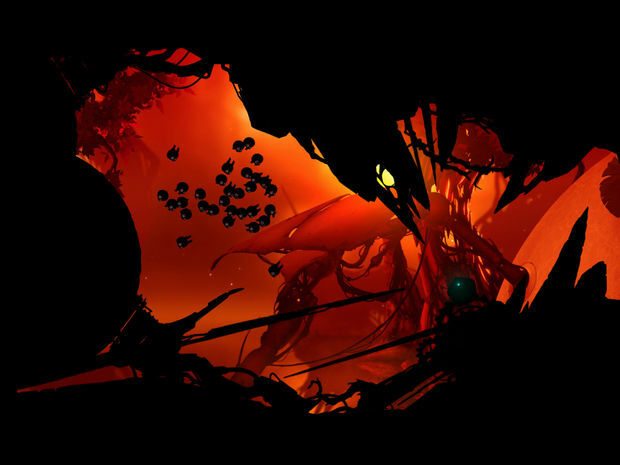 Much of the fun that comes from BADLAND is from the anxiety it will cause you in narrowly avoiding an insane deathtrap with your last fuzzy after watching a whole mess of clones explode throughout a rough patch of poisonous plants. LocoRoco this game ain't, as it's nearly impossible to save ALL of your community and so it becomes quickly necessary to focus on the ones that you just might be able to save and let the stragglers fall by the wayside or get burst into pieces by razors blades, gears, or javelin spikes. The game itself isn't exactly lengthy; I was able to finish the main set of stages in a few sessions. As mentioned before, it's split up into levels that go from dawn to night. This equates to four worlds with different art styles (dawn, noon, dusk, night) and ten levels in each. However, there are two important elements for replayability after getting to the credits. Namely, the three-egg challenges in each level, and the ridiculously fun multiplayer. The challenge eggs are like how stars are handled in games like Angry Birds, where you are awarded more for doing better in the stages. However, these particular challenges tend to be more specific to stages, from egg challenges that demand you to best the level in one single try, to others that ask you to keep a set number of clones alive by the end of the level-- not nearly as simple a task as it would first appear. Beyond this is the multiplayer, which is handled on a single screen and seems best suited for an iPad. Up to four players can pick a fuzzball of their very own, each with silly names and cute or weird characteristics, such as the one-eyed Cyclo or the irritated looking Fury. These fuzzballs are thrown into a level together, with each quadrant of the screen serving as the player inputs. The goal of the multiplayer is survival of the fittest, with the fuzzball that actually makes it the longest getting the lion's share of points, as well as added points for all for power-ups and clones picked up. I played the multiplayer more than a few times with my partner, and it proved to be a fun and addictive diversion that depended on skill just as much as on sheer luck. Though $3.99 seems like a high asking price for the typical iOS game, BADLAND is more than worth it with a beautiful, challenging single-player and fun multiplayer component, and the added bonus of more levels and a furthering of the mysterious story coming in a later update.